Behaviorist Dr. Ian Dunbar says that mental activity tires a dog out more than physical exercise. Gina is a high-drive dog. I often joke that the more I exercise her, the better shape she’s in and the more exercise she needs. Add some agility training to the mix, and she tires out much faster. Did you ever notice how tired you are when you’ve taxed your brain at work all day? It’s the same for dogs. Instead of doing one long training session, it’s best to add in a few minutes of training frequently throughout the day. I enrolled Sanchez in classes a couple of years ago, and now we play “find” games at home. I hide pieces of liver in boxes spread throughout the living room. 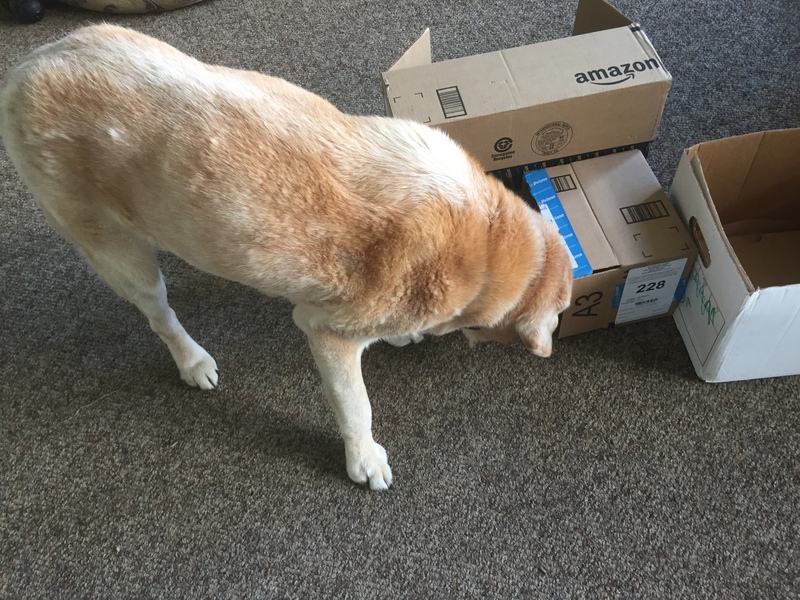 He searches for the piece of liver and is rewarded with more liver in the box when he finds it. He LOVES this search game. 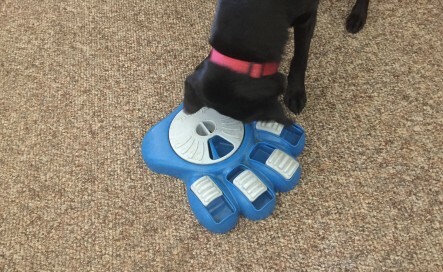 Instead of just placing down a food bowl, have your dog work for her food or treats. She’ll slow down her intake of dinner and treats while using her mental abilities. Other choices are stuffing soft food, such as a banana and almond butter, in a kong and then freezing it. Tugging is not a game of war. It is a game of play and is a way to bond with your dog. It’s commonly used to increase drive and focus before agility runs. 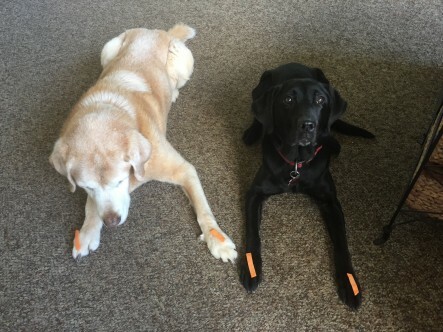 Tugging is also a great training tool during high distraction environments, an opportunity to reinforce “that’s enough” (meaning “game over, release the toy”), and it’s helped Gina tremendously with dog distraction. Tugging has been a way of teaching her that the best things in life happen in reinforcement zone with me, not with the stranger dog running by. Rain or shine, this is part of our daily routine. But, when we can’t get outside for walks, we do more tugging indoors, as it really tires her out. Even though I have two Labrador Retrievers, Sanchez no longer retrieves. He’s 13 1/2 and he’d prefer to lay on his dog bed and have me bring him his toy. However, I want to engage him when I play a fun game of retrieve with Gina. So, I toss her ball down the stairs. She retrieves it and while she’s running up the stairs to bring me back the ball for the next round, I toss treats to Sanchez down the stairs. He uses his nose to find them. Fun for all! We generally do this nightly, no matter the weather. 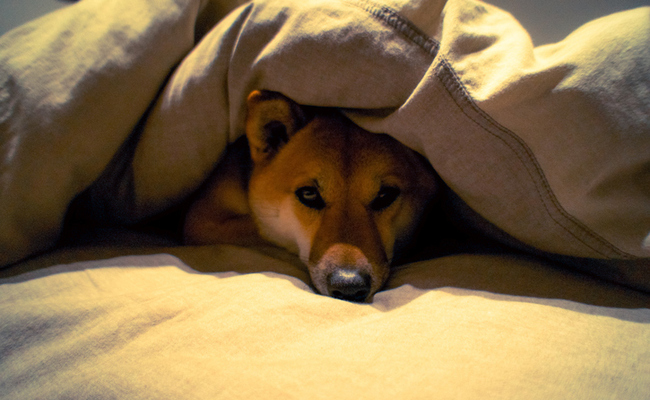 How do you keep your dog engaged indoors during the colder months? Thanks for adding your suggestions to mine in a comment below. Excellent reminder, but most of the time IÂ´m too lazy for something like that.